Peter A. Law is the senior principal of LAW & MORAN, a seven lawyer trial firm dedicated to the representation of individuals who have suffered injuries and death due to the negligence of others. 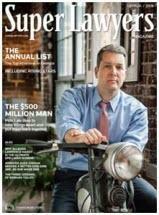 Pete Law has been recognized by various independent surveys as one of Georgia's top trial lawyers, was selected as 2011 Georgia's Top Trial Lawyer by Best Lawyers, and is annually selected as one of Georgia's Super Lawyers, including multi-year Top 10 and Top 100 vote recipient by the Super Lawyer independent survey. (See, Atlanta Magazine, Super Lawyers, 2003, 2004, 2005, 2006, 2007, 2008, 2009, 2010, 2011, 2012, 2013, 2014, 2015, 2016, 2017 & 2018). The Georgia business community also selected Pete as a top trial lawyer, selecting him as a "Georgia Legal Elite," (Georgia Business Trend, 2004, 2005, 2006, 2007, 2008, 2009, 2010, 2011, 2012, 2013, 2014, 2015, 2016, 2017 & 2018). The firm has exceeded $800,000,000.00 worth of jury verdicts and settlements. Pete is also rated by his peers as AV rated, the top designation available by legal publication Martindale Hubbell, and is listed annually in the Best Lawyers in America trade publication. Areas of practice include automobile accidents, trucking accidents, premises liability, negligent security, and virtually all types of cases involving injury or business torts. Pete has been counsel for the Plaintiff in approximately 150 recoveries each exceeding one million dollars ($1,000,000.00), including more than 50 separate recoveries exceeding three million dollars ($3,000,000.00), approximately 300 recoveries exceeding $100,000.00, and total case recoveries exceeding $800,000,000.00. In addition to trying cases, Pete regularly speaks at Continuing Legal Education (CLE) Seminars nationwide. Georgia, Florida, South Carolina, North Carolina, Indiana, New York, Arizona, Minnesota, Alabama, Tennessee, Oklahoma, as well as cases occurring, or for families, residing in Indonesia, Africa, Jamaica, Iraq and Mexico.